The Augustinians' San Agustin Church is hailed as "The Mother of All Philippine Colonial Churches" primarily because of its centuries-old splendor and also being one of the few remaining churches in the Philippines that survived natural calamities, wars, and even Filipino negligence. 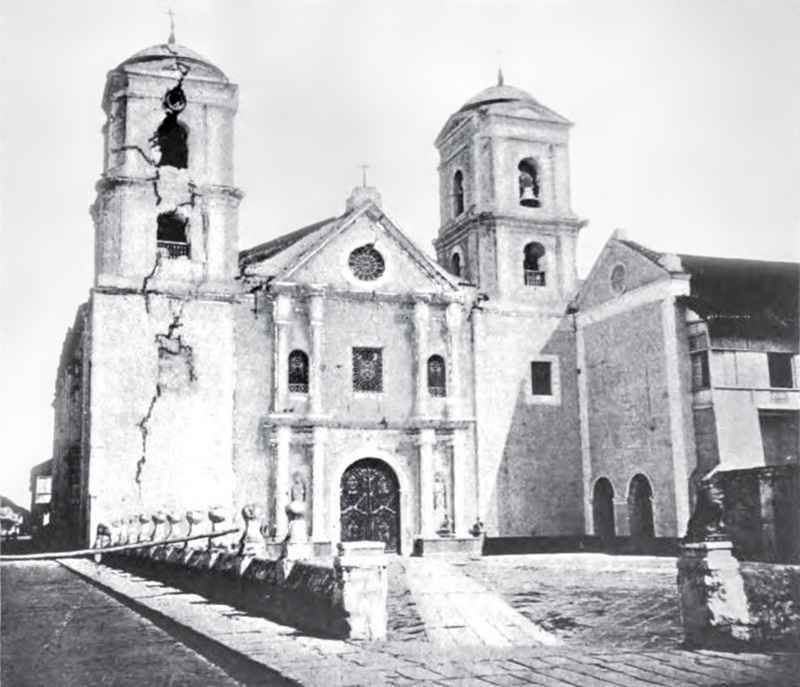 Considered as the Philippines' first earthquake-proof building, it has endured several catastrophic earthquakes that rocked the city, proof of the church's strength and vigor to stand the test of time. It has been dubbed as a permanent miracle in stone. Oh, and did I mention that it was declared a UNESCO World Heritage Site in 1993, under the title "Four Baroque Churches of the Philippines". 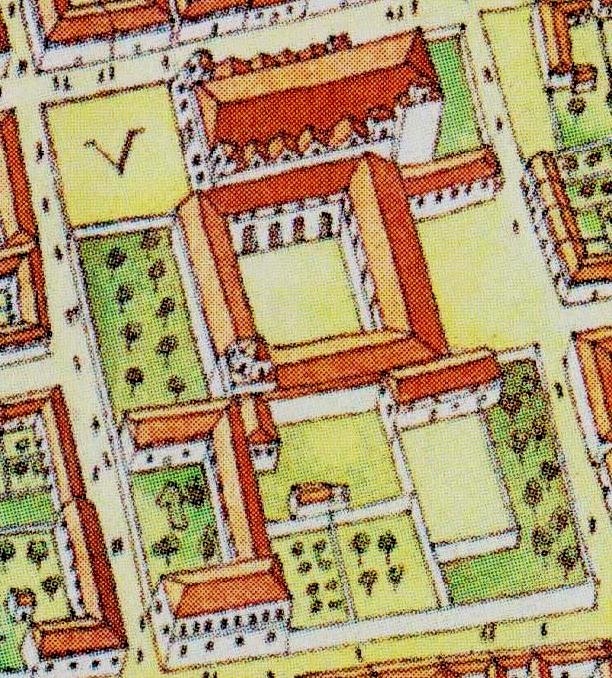 Augustinian Complex, 1713. 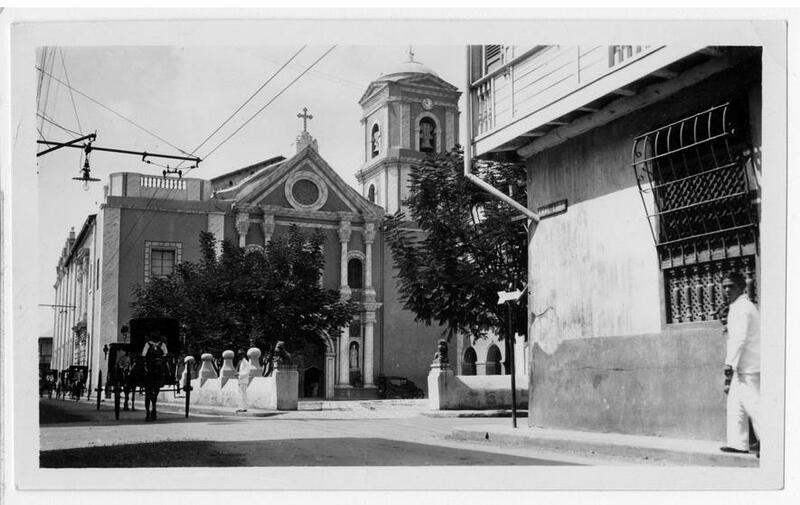 The San Agustin Church on top, the attached convent (museum) on the center and the monastery (ruins) on the bottom left. 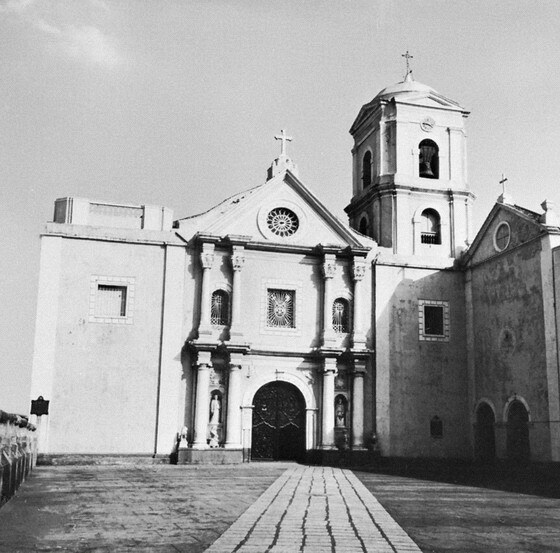 The San Agustin Church is the oldest stone church in the country. Located along Calle General Luna cor. 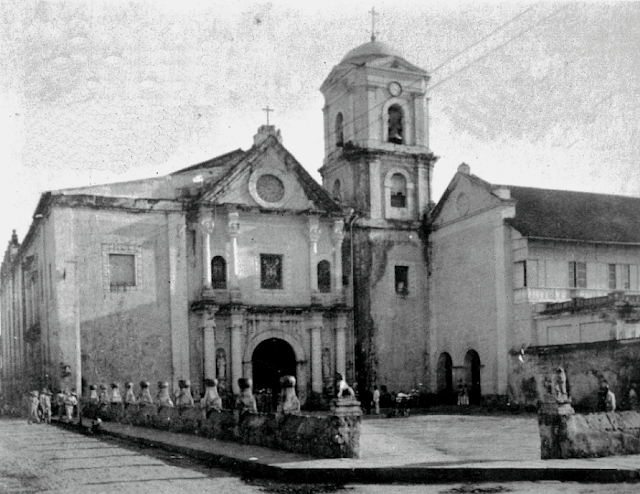 Calle Real, the present structure is actually the third church to be built in the same lot by the Augustinians. The two churches were both destroyed by fire in 1574 and 1584, respectively. In 1586, plans of constructing a church and an attached monastery made of stone were approved by the friars. 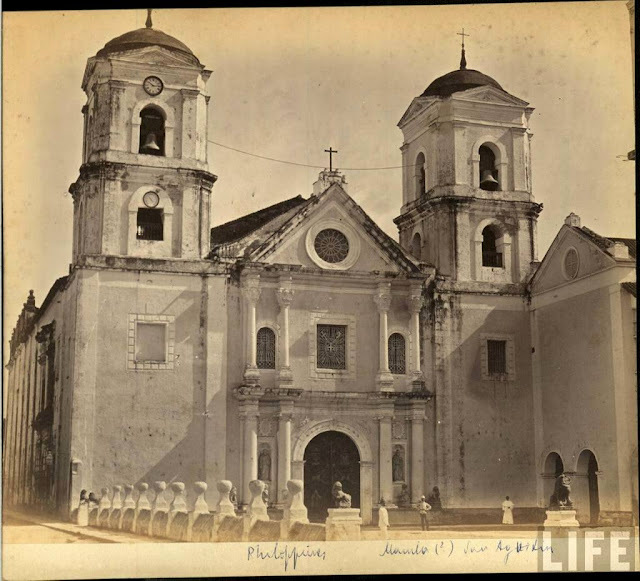 Headed by Spaniard Juan Macías, the church was formally declared complete in 1606 and was originally named Iglesia y Convento de San Pablo (Church and Convent of St. Paul). San Agustin Church before the 1880 earthquake that destroyed the left bell tower. It has been said that the design of the church was derived from Augustinian churches in Mexico. In 1854, renovations were made under the supervision of Luciano Oliver. 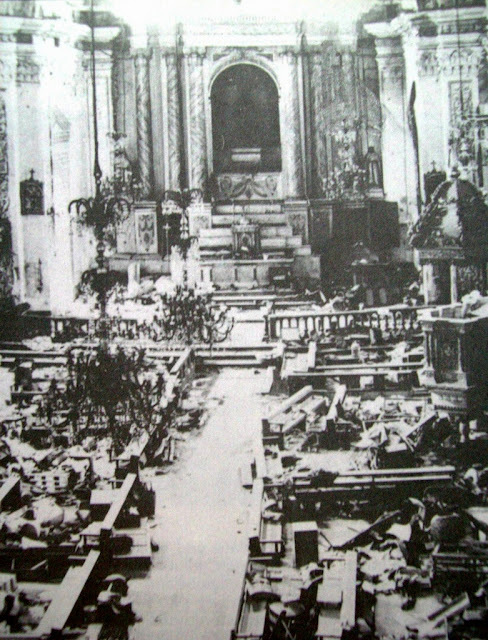 In 1863, an earthquake shook the city leaving everything into rubble but the San Agustin Church stood proudly as the only public building left undamaged. The church actually had two bell towers but the strong earthquake of 1880 damaged the church leaving a huge crack on the church's left bell tower. The crack was repaired, but the left tower was permanently removed as it appears today. 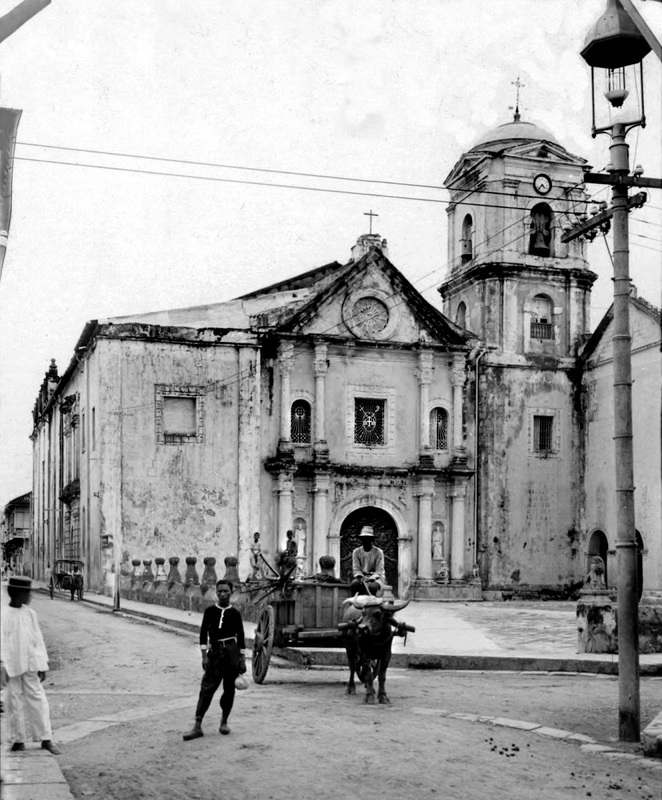 San Agustin Church after the 1880 earthquake. The earthquake damaged the left bell tower and left a crack on the church's facade that was eventually repaired. Late 1800s to early 1900s. The left bell tower is gone by this time. Showing a newly renovated facade, c1900s. It still looks like this today. The simple and direct to the point facade of the church is in the High Renaissance style. People say that compared to its other neighbors, the church's facade "lacks grace and charm" and was also regarded as "boring". They even say that even the Augustinian friars were displeased with the design. The ornate carvings on its wooden doors are fine examples of Baroque touches that were applied to the church. Near the church's entrance, you'll notice granite sculptures of lions. These lions were gifts from the Chinese who converted to Catholicism. View from Calle General Luna, c1900s. "The symmetrical composition is prefixed by pairs of Tuscan columns that flank the main door of the two-tiered facade. The vertical movement of the paired columns is adapted at the second level by equally paired Corinthian columns. At the second level, mass and void alternate in a simple rhythm of solid walls and windows. The two levels, emphasized by horizontal cornices, are then capped by a pediment that is accentuated with a simple rose window. The facade’s hard composition is held together by two towers; unfortunately, the missing left belfry further exaggerates the lackluster facade." View of the altar from the nave. Notice the trompe-loeil murals on the walls and the ceiling. 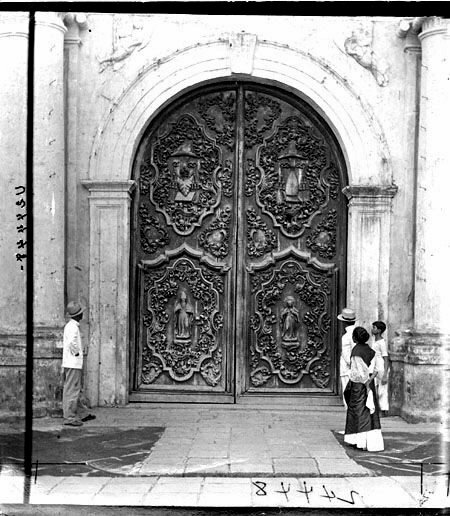 Intricately carved wooden doors on the church's main entrance. 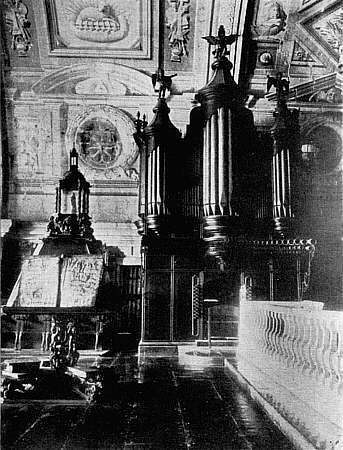 San Agustin Church choir and organ, c1912. 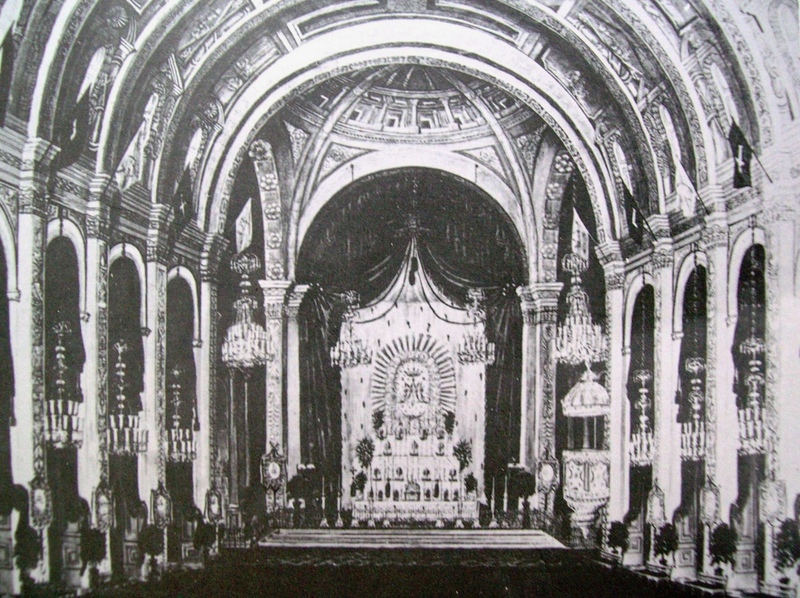 If the exterior of the church was initially not well-received, things were different when it came to its interiors. The church's trompe-loeil walls and ceilings are considered a marvel in all of the country's colonial churches. Painted by Italian artists, Cesare Alberoni and Giovanni Dibella, they managed to sculpt and give life to the church's interiors using only their paint brushes. The church's retablo mayor and pulpit were impressive as well. The church also contains the remains of notable Filipino and Spanish people who have made their marks on history. The tombs of Miguel Lopez de Legazpi, Juan de Salcedo, Martin de Goiti, Juan Luna and Pedro Paterno to name a few, are all buried here. The church's sacristy was also the place where the Spaniards surrendered to the Americans in 1898. A vintage postcard showing the church and the attached monastery. 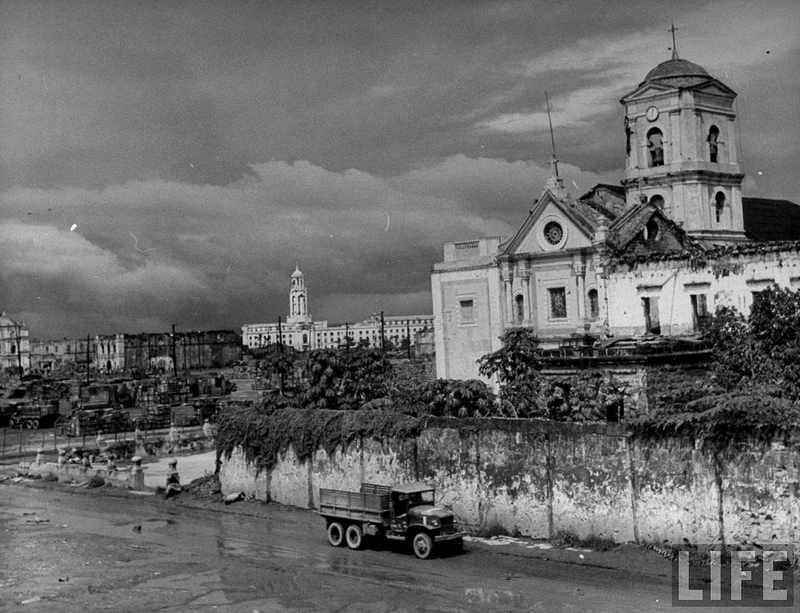 Another miraculous moment occurred during the Liberation of Manila in 1945. 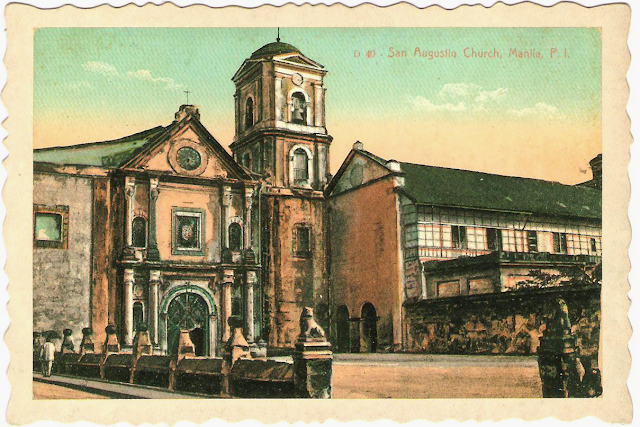 The San Agustin Church was the only, I repeat ONLY, church that survived the bombs and the shelling of the Japanese and American forces. It only sustained damage on the roof and of course, bullet holes all over. However, the attached convent was bombed and but was rebuilt as a museum in the 1970s. Chaos inside the church during World War II. The altar and the pulpit can be seen in this photograph. American soldiers and a priest praying (Mass, maybe?) 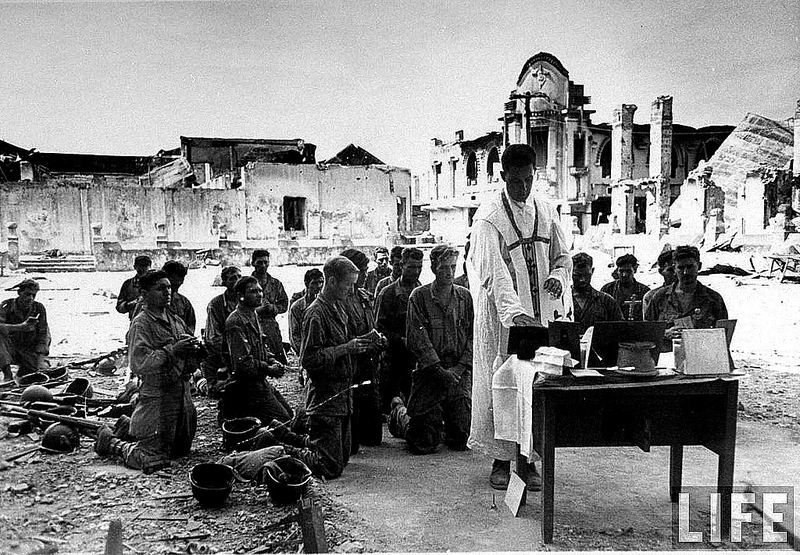 in the church's courtyard after the Libertion of Manila, 1945. 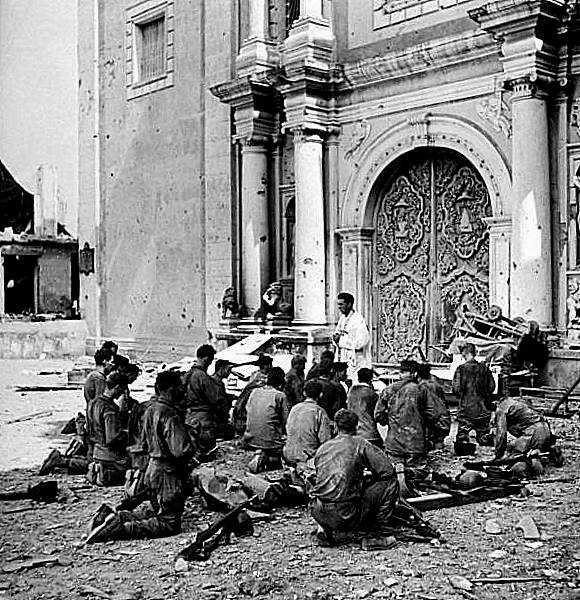 American soldiers and a priest amidst the ruins of Intramuros, 1945. Standing tall and proud, 1945. Manila City Hall can be seen in the background. Also, the ruins of the San Francisco Church and the VOT can be seen on the left. One can only appreciate the beauty and the history that wander the walls of the San Agustin Church. It truly is a marvel that this church is still standing today, looking as dignified as ever as it did 400 years ago. As Filipinos, we must be really thankful that this landmark was not taken away from us. Even the pictures telling us how lucky we are of having such a beautiful Church. I hope we maintain the historic buildings like this. On the picture with the caption "Showing a newly renovated facade, c1900s. It still looks like this today. ", the date is incorrect. The black spot on the left is a historical marker from the Historical Research and Markers Committee (ancestor of the NHCP) installed in 1934 (one of the first batch of markers ever installed, as the committee was established on the same year by American law). The marker still exists, but it has since been moved inside the church. Meaning the date of the picture is sometime after 1934 (when the San Agustin was restored/renovated in time for the installation of the marker).